Felix-Promotion’s show in Kecskemet March 8 where former WBO lightheavy and WBC cruiser king Zsolt Erdei (33-1) says farewell with a fight for the vacant WBO Euro title against Georgian Shalva Jomardashvili (36-6-2) will be the biggest boxing event in Hungary since Erdei and now retired supermiddle Karoly Balzsay headlined a Universum show in Budapest back in 2007. In the co-feature superbantam Zsolt Bedak (19-1) take on George Gachechiladze (13-9) for the vacant WBO Euro belt. Added to the bill is former WBC cruiser champ and heavyweight contender Juan Carlos Gomez, who like Erdei is trained by Fritz Sdunek, and the Black Panther, now back at cruiser, will go for the WBO Int’l title against an opponent to be announced. 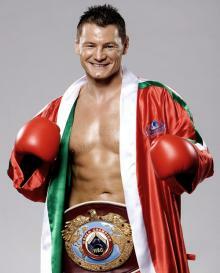 Rounding up the title fights is middleweight Lajos Mark Nagy, who fights for the WBO Youth strap. Nagy is unbeaten in 16 fights but is relatively untested. SES have a busy March beginning on the first of the month with Robert Stieglitz defending the WBO supermiddle against Arthur Abraham in Magdeburg. Then on March 28 in Potsdam SES stage a show at the MBS Arena headlined by female superfeather champ Ramona Kuehne (21-1) defending her three titles against an opponent to be announced. Also on the bill are lightheavies Robin Krasniqi (40-3) and Dominic Boesel (14-0). Heavyweight Steffen Kretschmann (16-2-0-1) is also on the bill and is now promoted by SES. Boxe Loreni from Italy won the purse bids today in Rome for Brunet Zamora´s defence of the EU lightweight title against Belgian Jean Pierre Bauwens (32-1-1). Boxe Loreni, headed by Mario Loreni, put in a bid for 23 500,00 Euro while Liesbet Noens bid 15 003,00 Euro. Date and site is to be announced. Zamora is 25-1-2. French promoters AS Montferrandaise bid 20 100,00 Euro at today´s purse bids in Rome for the right to stage Ruben Nieto’s defence of the EU superlightweight title against Frenchman Chaquib Fadli. Rimer Boxe from Spain finished second best with a bid for 15 000,00 Euro. Nieto (14-0) vs Fadli (13-3) will go head May 30 in Clermont Ferrand (France).